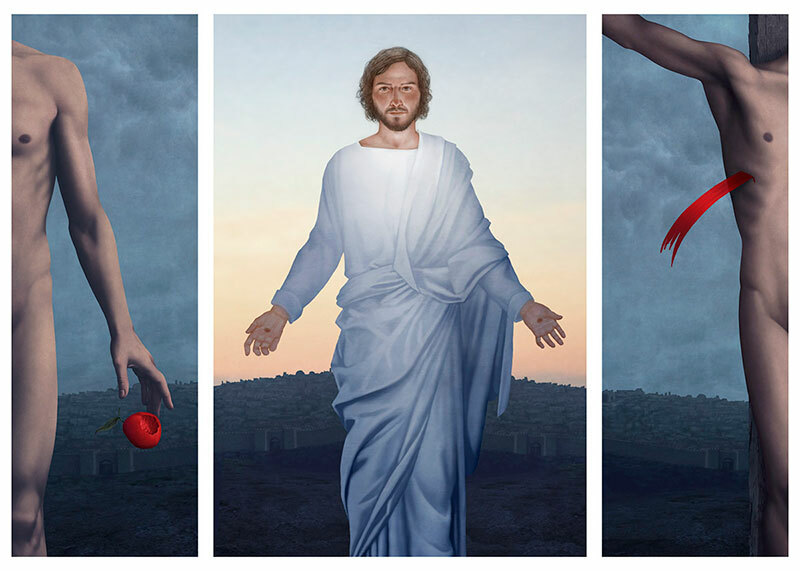 Three years ago last week was my post about the Risen Savior Triptych and the results of the informal survey that sank it. I think it would be a good time to revisit the project. Although I never had the chance to produce it as a full-scale triptych, it is till one of my favorite designs. It was part of my MFA thesis project, designed for my home church, and I invested a lot of time and thought into it. But with three more years of perspective, what would I do differently now? The most important lesson I learned is to never, ever poll the audience. To my inexperienced ears, it sounded like a good idea. The main reason I went along with it is because I assumed that WELS pastors would have more knowledge and appreciation for liturgical art than the average layman, and that being theologically trained, they would surely support it. But I was wrong. We don't give our pastors any training in this area, so what they know is only what they learn from experience or self-study. And God knows that the chances of experiencing high church liturgical art in the WELS are slim to nil. There's another reason I should have been against the poll. The visiting pastors were neither members nor shepherds of Risen Savior. Not their congregation, not their call. If the decision to commission liturgical art is put to your pastor and board of elders, don't let them pass the buck. Since I was on the board of elders at the time, this was my failing as well. Another lesson learned: have ready responses for the most common objections. Three years ago, I was unprepared for these objections because they were so ridiculous that it never entered my mind that they might be raised. But having heard plenty of feedback affirming that these objections are almost universal among Protestants, it seems that having the right answers and responses is a good way to ensure that the deck is stacked in your favor. It's too Catholic. There are several ways to counter this argument to a Lutheran. There are a couple of good Luther quotes that say why it is good to have Jesus "before my eyes" (that is, having a visible sign of Christ or his passion). Historic precedence shows that Crucifixes, altar paintings, etc. were prominent in Lutheran churches immediately after the Reformation, indicating that there is nothing inherently "Catholic" about them, aside from content. The Book of Concord also has several sections that address human traditions in the Church, and why they should be kept. But finally, any objection to something being "Catholic" ultimately boils down to "I don't want it." There is nothing that can't be labeled as Romanist if a church or individual doesn't like it. If it offends even one person, that's one too many. I don't know who first started throwing this phrase around, but it's an argument that can't be contradicted, because it is based on fearful conjecture. In this culture, anyone could be offended by anything. And when we have Christ's promise that his gospel will indeed cause offense, and be a stumbling block, and be pure foolishness to those who are perishing, the fear of causing offense is not a fear that Christians are permitted to succumb to. We are not permitted to withdraw from the Church anything that we think may cause offense, because God's Word causes offense. This argument sounds like a pious, biblically-informed argument, but is most likely another way of saying, "I don't like it [but I'm afraid to stand behind my own opinions]." An ascended Christ would be more Lutheran. There's nothing wrong with using a Christus rex, but there are probably ulterior motives at play if there are objections to the crucifix. This argument combines aspects of 1 and 2. It's a variation on "It's too Catholic," because the urban myth has circulated among Protestants that the empty cross is Lutheran, whereas the crucifix is Catholic. You might also hear that showing the corpus is to deny the resurrection. Here, St. Paul is your champion: "For I was resolved to know nothing among you except Jesus Christ and him crucified" (1 Cor 2:2). Many mainstream Lutherans associate offense with the cross (rightly so), and so their missional orientation causes them to be embarrassed of the cross. Here, your best weapon is to show them that Christ crucified is missional. For churches who are ostensibly trying to bring in the recovering alcoholics, single moms, teenagers struggling with addiction—there is nothing more comforting than knowing that Christ has been there. In fact, anything that you have suffered, he has suffered immeasurably more. Trying to switch out the cross for a theology of glory is to trade any chance of true comfort for a false and temporary notion of security. Spending money on artwork is not good stewardship. This argument is unfortunately firmly entrenched in the modern Protestant psyche. There is a kind of cultural utilitarianism that objects to anything that goes beyond a minimally functional space. At least, in public worship spaces. If you took a tour inside the home of every person who has ever made this argument, you would likely find a great deal beyond the functional. But to look to Scripture (John 12), we find that beautiful passage in which Mary pours the expensive nard on Jesus' feet, to the loud objections of Judas. Jesus did not accuse Mary of bad stewardship, but defended her act of love. It is a failure of education that Lutherans tend to think of stewardship mainly in the sense of monetary wealth, instead of "time, talents, and treasures." We most often overlook talents. "Having then gifts differing according to the grace that is given to us, let us use them" (Rom 12:10). Lastly—and I may be wrong about this—I sometimes wish that Confessional Lutherans would not place undue emphasis on building a consensus. Yes, I recognize that Lutherans have elected to be more democratic in the way our churches are governed, and this can be a great blessing. But it can also be a hinderance to accomplishing change for the better. For instance, when a pastor acts unilaterally on decisions affecting the church, he may face a mutiny. On the other hand, is it fair or practical that artists and the few pastors who value their contributions to the church should have to shoulder the task of educating the laity on the value of liturgical art before anything can be done about it? How many decades would it take to "build a consensus" in a church of 500? There are strong worship leaders within the WELS and other Confessional synods who are promoting good music and consistent use of the liturgy. At last year's School of Worship Enrichment in York, NE, Pastor Johnold Strey remarked that in regard to implementing good liturgical worship, "Sometimes you just have to experience it." Can't the same be said of art? Lutherans are sometimes so resistant to change that we can't see what good could possibly come of it. Maybe our pastors should be more authoritative in this area, and simply say, "We need this. It's a great idea, it's beautiful, it's good stewardship, and it will help to proclaim the gospel." A recent post at Brothers of John the Steadfast criticized the contemporary worship services at Concordia University Nebraska. I can't fully defend the article, because it was written from the perspective of a one-time visitor, and some of the points were not entirely accurate. However, the comments it generated, especially by many offended CUNE students, were of special interest. We can't expect non-Lutherans to worship like Lutherans. Traditional liturgy is off-putting to unbelievers. Not everyone is edified by liturgical worship. As long as we are true to the Word (or at least don't preach false doctrine), the worship style is irrelevant. So based on these premises, the students feel convinced that having CoWo chapel is not only acceptable, but is to be preferred over traditional liturgical worship. Unfortunately, the premises are made of straw and don't hold up to scrutiny. Let's examine them one at a time. 1. We can't expect non-Lutherans to worship like Lutherans. In what universe would a Baptist walk into a Greek Orthodox church and expect to find a gospel choir? Ours, apparently, because that is the argument being used here. Lutherans are worried that non-Lutherans might pay to attend a Lutheran college, be taught Lutheran theology by Lutheran faculty, but then be shocked and disgusted that they worship like Lutherans? If a person has decided to attend a Lutheran school, then let's be honest to him and to ourselves about our heritage and our Confessions (even that troublesome Article XV of the Apology to AC). 2. Traditional liturgy is off-putting to unbelievers. So what happens if a demographic of Wiccans starts attending a Lutheran college? Can we mutilate the divine service enough to appeal to them? This line of thinking is dead wrong for two reasons. The first is that worship is not an outreach tool. The second is that it assumes that God's Word and the gospel have no real power over the soul, placing the importance instead on "style." 3. Not everyone is edified by liturgical worship. Yes, everyone is edified by liturgical worship, unless he has hardened his heart to the Word. What this argument is really saying is, "I don't like liturgical worship [it doesn't make me feel good]." Again, this is wrong for two important reasons. The first is that it attempts to drain the Word of God of its power. The liturgy is not an empty set of rites that might as well be a bunch of nursery rhymes. In large part, it is the Word of God. It is assembled from the inspired songs of Scripture into a regular structure that administers law and gospel at every service. It must edify us. This argument is like saying that a person who does not like spinach will not be nourished by it, which is obviously not true. God's Word is efficacious without our "spicing it up" with drums and guitars. The second error is in thinking that my feelings determine what is good for me and what is not. If what I like determines what is good, Twinkies are just as good for me as steak. And if the emotional high I get in CoWo really is edifying, then so is being told that I just won the Powerball, even if it isn't true. 4. As long as we are true to the Word (or at least don't preach false doctrine), the worship style is irrelevant. Wrong x 1000. 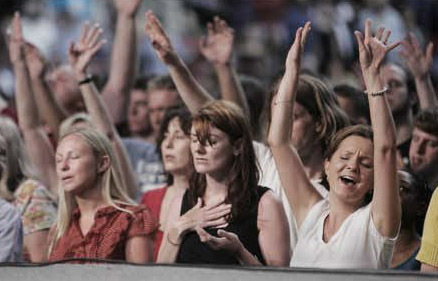 Worship flows out of theology. Lutherans cannot worship like Quakers, Methodists, Pentecostals, Reformed, or Evangelicals. Not only because our Confessions forbid casting aside the "customary rites," but because our theology naturally produces worship that is liturgical, participatory, gospel-oriented, edifying, and centered on Word and Sacrament. From my experience at morning chapels at CUNE, there seems to be at least a substantial portion of students and faculty who want to foster a complete disconnect between theology and practice. But that disconnect cannot be maintained long before cognitive dissonance sets in. The tail will start wagging the dog, and doctrine will conform to practice. I don't mean to pick on CUNE or even the LCMS here, because it's a widespread problem among Lutherans. We can't fool ourselves into thinking that we can maintain pure doctrine and law-gospel preaching while entertaining non-Lutheran worship styles.